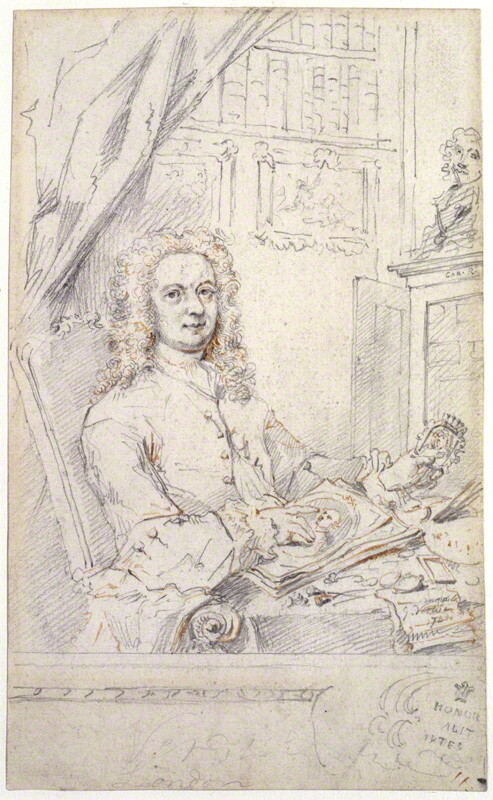 Vertue’s self portrait pointing to an engraving and holding its source, a miniature. George Vertue was the premiere artist-engraver of the first half of the 18th century. Developments in the print industry had made it profitable for artists to create increasingly sophisticated images by means of copper or steel engravings. Considerable skill was involved, both in design and cutting, and Vertue, over a decades-long career, became the master and overlord of this technique. At his death he left 500 engraved portraits alone, plus numerous illustrations of other subjects. For centuries the only way to share an image with more than one person or family was to have copies made of it in oil or gouache. Then engraving artists began to create what can be seen as the forerunner of the coffee table book, portfolios of unbound images printed on paper that could be sold to dozens of buyers. And while a painting can be lost or damaged, multiple copies produced from an engraving guaranteed that at least one will survive over time. Vertue’s engravings, and those of the many others at work during the late 17th and early 18th century, have left us a priceless record, not only of the important personalities of their own period, but, by copying the portraits of persons long dead from portraits no longer extant, we can see the faces of people from previous eras. Not all these painted images, or their engraved copies, are as true to life as we require today, our expectations sharpened by the expertise of photography, but some are obviously more trustworthy than others. Some portraits, such as those by Hans Holbein during the reign of Henry VIII or Van Dyke during that of Charles I, are incredibly real and trustworthy, and so their copies by Vertue are equally trustworthy. Unfortunately, the reigns of Elizabeth and James produced very little home-grown portraiture of any artistic value. It is here that the visual truth about the author of the Shakespeare canon has been buried––buried in plain view, were we capable of decoding it. Accustomed from childhood to Court life (Vertue’s parents had been servants in the household of the exiled James II), through his artistry, his technical skill and his excellent taste, George Vertue became the friend and confidante of peers inclined towards the arts, antiquities and literature. By 1720 he had become the personal friend and consultant of Edward Harley, 2nd Earl of Oxford (by the second creation). Following Harley’s death in 1741, he remained the friend and consultant of his widow, the heiress Henrietta Holles, a descendant of Edward de Vere’s cousin, Sir Horatio Vere. In their time, the Harleys, first the father, then the son and his wife, were great leaders of Court society and patrons of poets, artists and antiquarians. Edward’s father, the vastly wealthy Robert Harley, first Earl of Oxford (second creation) was Secretary of State under Queen Anne, then her Chancellor of the Exchequer, and ultimately her Lord Treasurer. Robert Harley used his wealth and power to amass the collection of books and manuscripts that would eventually become the British Library. A poet himself, Harley Sr. was also the great Maecenas of the Silver Age in English literature that followed (roughly 150 years later) the Golden Age of Shakespeare, Spenser, Sidney, Bacon and Milton. Patron of Daniel Defoe, Jonathon Swift, Alexander Pope, and John Gay, Harley Sr. was a founding member of, and contributor to, the famous Scriblerus Club, where he and his brilliant friends would indulge their appetite for mirth by plotting, over interminable cups of coffee, literary tricks to play on the dull bourgeoisie, one of which was the creation of a fictional author, Martin Scriblerus, under whose name several members published satires. With his death in 1724, Harley Sr.’s entire estate, library, and collection of antiquities, including portraits of family members and various persons of social standing, passed to his son, who compounded it by marrying the highly-educated heiress Henrietta Cavendish Holles, daughter of Gilbert Holles, Earl of Clare, Keeper of the Privy Seal, and second in wealth and importance only to Harley’s father. There are moments in history when the forces that hold things together give way, and many changes occur at once. This was such a time. With the death in 1714 of Queen Anne, the last of the Stuarts, the urge to accumulate (she was immensely fat) gave way to a national urge to trim down and focus (in everything that is but hair) when the Whigs (I almost said wigs) took over the government. Denied political power, the Harleys turned to intellectual pursuits, purchasing important manuscripts, books and memorabilia as their fellow aristocrats turned centuries-old archives and collections into cash, a venture which eventually brought this second creation of Oxford earls into serious debt. During the lifetime of the two Harleys, their wives and their daughters, they became the primary respository for much of the scientific and artistic wealth of England––plate, jewelry, portraits, statues––plus science specimens from all over the world. By the 1750s, with father and husband gone, the expense of maintaining these vast collections became insupportable and the Duchess of Portland and her mother chose to realize Edward Harley’s dream of a great national library, selling most of the family collections to found what is now the British Museum and the British Library. For many years up until then, George Vertue had the good fortune to hold, examine, admire and research this great accumulation. Out of it the one totally trustworthy image of the 17th Earl of Oxford (the Welbeck) was recovered; Vertue, in his voluminous notebooks, suggests there were others. Vertue’s frontispiece for Alexander Pope’s 1725 edition of Shakespeare’s works. The portrait that is prefixed to the first volume is a most remarkable one. 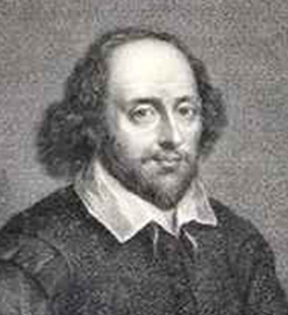 It is supposed to be an engraving from the Chandos portrait of Shakespeare, and is engraved by G. Vertue. It is dated 1721, and bears no resemblance to that portrait whatever. Indeed, it is far more like the pictures of James I than the Chandos portrait of Shakespeare. That Vertue’s Shakespeare with a ruff resembles James I is one of the absurdities that continues to be endlessly repeated. At least Norris sees that it could not have been a version of the Chandos. The ruff is a problem. Ruffs were an elaborate and expensive flourish that only the nobility could afford; for an actor or common playwright to wear one for a portrait in the early 17th century would have been a serious presumption. 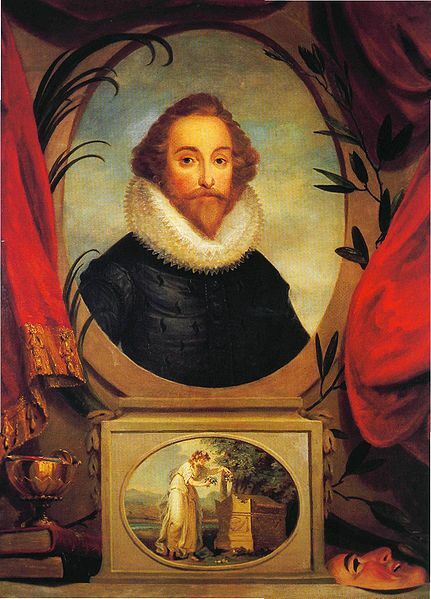 Despite these problems, the man with the ruff has been used to represent Shakespeare numerous times, as in this 19th-century version of Shakespeare. With the help of the internet and a lecture by authorship scholar Andy Hannas given at the Shakespeare Authorship Roundtable in Pasadena in 1995 (and authorship scholar Richard Whalen for providing me with the text), I’ve managed to locate the most likely model for Vertue’s Shakespeare with a ruff. 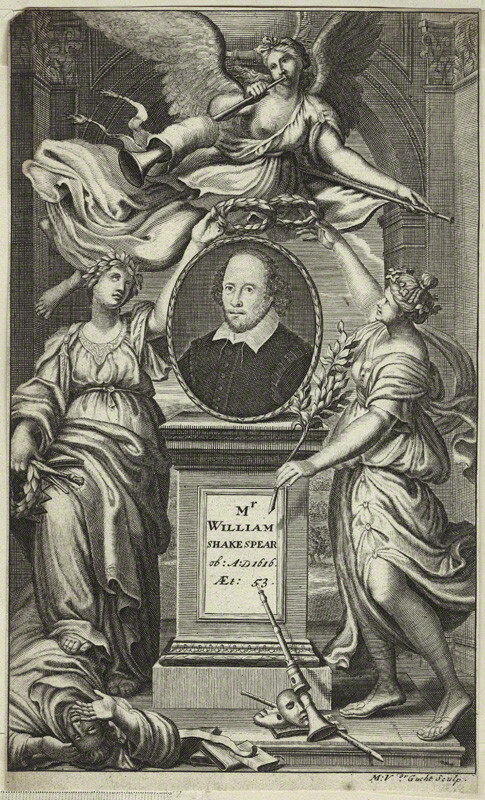 It must have been taken from a miniature owned by Robert Harley, as noted in the Walpole Society’s 1914 Welbeck Abbey Miniatures, labeled by the framer, Bernard Lens: “Shakespear’s head.” While Vertue’s engraving reproduces exactly the facial characteristics of this miniature, through differences too subtle to pinpoint, Vertue’s version has altered what the journal editor noted is the “strong will and character” of the Harley miniature. Where the Harley subject is determined, Vertue’s is resigned. Harley miniature c.1714 compared with Vertue’s Shakespeare with ruff, 1721. In examining these early images of Shakespeare, another possibility emerged, that the miniature labelled “Shakespear’s head” owned by Harley Sr. was taken from a portrait of the courtier playwright John Fletcher. 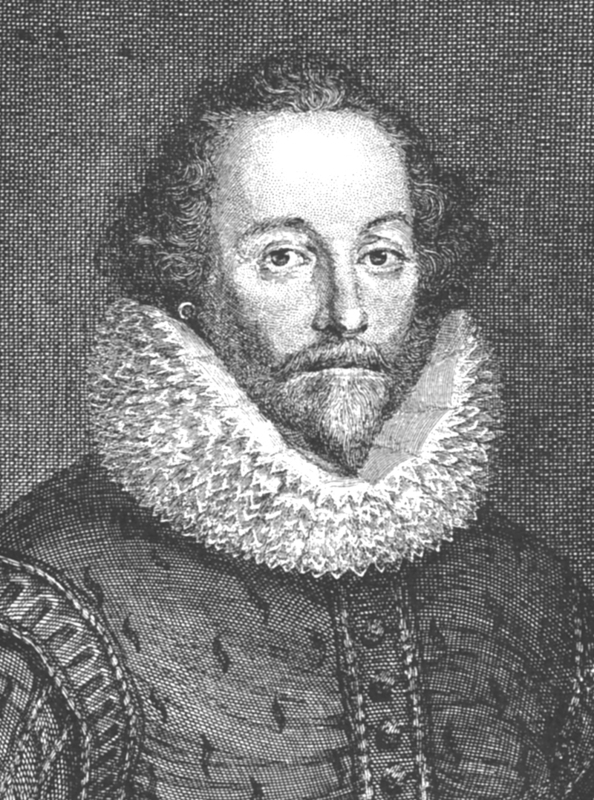 It may be that for a time during the mid to late 17th century, it was thought by some that Fletcher was the author of the Shakespeare canon. Images of Fletcher abound in the collections. Here are three compared with Vertue’s Shakespeare with a ruff. 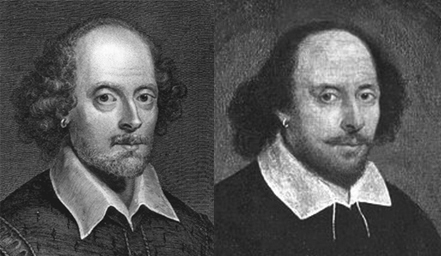 L-R: Vertue’s Shakespeare with ruff; Fletcher portrait; Vertue’s copy of Fletcher portrait; Fletcher in later years. What we can take from this is that, by 1721-25, all three, Pope, Harley, Vertue, and probably their entire coterie, brilliant themselves and first to recognize Shakespeare as a fellow and a master, were on the lookout for something better than the Chandos with which to identify him. As an Art historian, member of the Society of Antiquities, and the official engraver for Oxford University, Vertue would have been more concerned than perhaps might some other engravers to give the world a true image for its great playwright. That he was more concerned than most artists of the period with the veracity of his portraits seems clear from Alexander Chalmers’s Biographical Dictionary of 1812, in which he attributes Vertue’s laxness in completing a series of portraits of prominent men of earlier times, a series Vertue himself had planned, to his “rigid regard for veracity, which made him justly scrupulous of authenticating the likenesses of deceased characters without the clearest proofs” (30.321). One wonders which “deceased character” in particular Vertue was finding it so difficult to portray? Among those he did portray, Shakespeare was not included. His rival, Jacob Houbraken, who took up the series (Birch’s Heads of Illustrious Persons of Great Britain) where Vertue left off, had no such quibble. Where the subject is known it’s clear that a likeness for Houbraken hadn’t nearly the importance it had for Vertue. 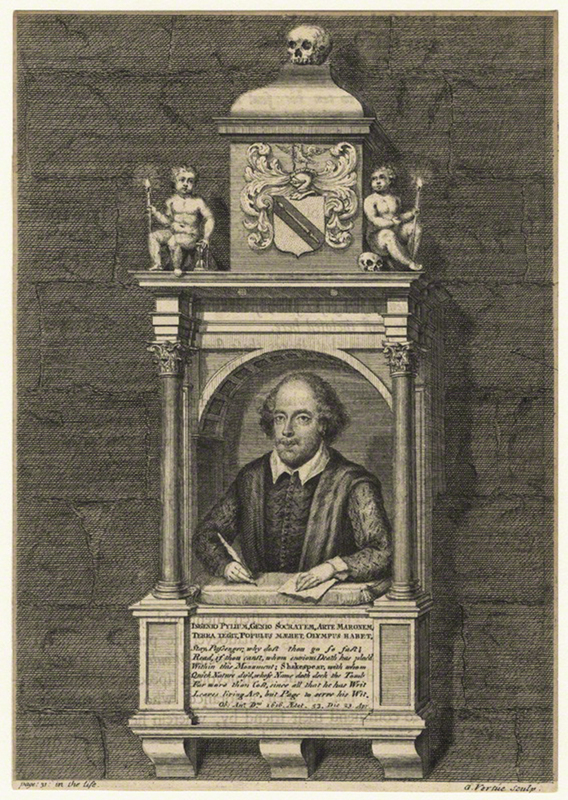 The Shakespeare he engraved for the series was yet another “improved” version of the Chandos––the dull, unintelligent Chandos, the source of the bald dome on every faked portrait, statue, bust or cartoon ever since. And––most astonishing!––also the model, according to every authority from then on, for Vertue’s other Shakespeare. 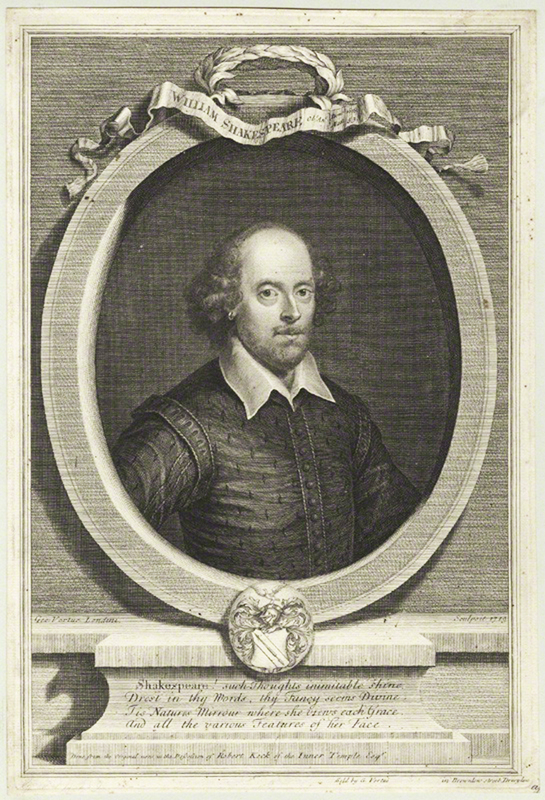 Vertue’s 1719 portrait of Shakespeare, from a series of twelve Heads of Poets. Comparison of Vertue engraving to Chandos portrait. Beards on both lightly retouched to show the jawlines. The heads are a different shape, the Chandos forehead slopes back from the brows while the Vertue does not; the Chandos has a weak chin, the Vertue a strong chin. the Chandos lips are relaxed, the upper lip more prominent, while the lips on the Vertue are pursed, the upper lip tight. The hair is different. There is a shadow on the skull of the Vertue where a bit of fuzz may remain. There is no suggestion of any fuzz on the Chandos. Had the master engraver with his “rigid regard for veracity” wished to replicate the Chandos, there would be no room for discussion. Certainly he would have been just as exact with the Chandos as he was with so many other famous portraits. While we can easily see the likeness to the original in the scores of versions of the Chandos created over the centuries, any likeness between Vertue’s Shakespeare with a collar and the Chandos comes from the similar position of the heads, the general shape of the hair, the balding hairline and the collar, possibly Vertue’s attempt to reconcile the image with the Chandos and the Droeshout, “these but the trappings and the suits of woe.” But identity lies in the head and face, and the face and head of Vertue’s other Shakespeare and the Chandos face and head are nothing like. The fact is that, despite the continued repetition by every scholar and critic who has ever discussed it, the great George Vertue, premiere engraving portrait artist of his time, never reproduced the Chandos as a portrait of Shakespeare! In at least three places he left images from two portraits of two very different men, neither of them looking at all like the man portrayed by the Chandos––unless having a nose, two eyes, a mouth and a forehead qualifies as a likeness. So why has the world of Shakespeare scholarship so abjectly and wrongly continued to pipe the refrain that Vertue’s Shakespeare with a collar is a copy of the Chandos? This misconception must have arisen from Vertue’s own notebooks, and from the line he added at the bottom of the engraving: “Done from the original now in the possession of Robert Keck of the Inner Temple, Esq.” Also from Vertue comes the information that by 1619 the Chandos was owned by Keck, collector of Shakespeare artefacts; that with his death on November 23, 1619, it passed––one after another––to various members of his family until it ended up with the descendant who married the aristocrat whose name then became attached to it. 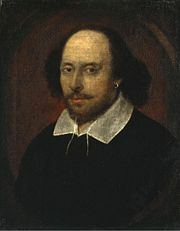 Apparently it has never occured to anyone that, as a well-known collector of Shakespeare memorabilia, Keck could have owned more than one Shakespeare portrait. Either that or Vertue’s statement was a red herring meant to steer the viewer away from the subject’s true identity. Adding to the mystery of Vertue’s Shakespeare with a ruff is the fact that he repeated the face on his Shakespeare with a collar in the engraving he did of the Stratford Bust that faces his reprint of Rowe’s “Life of Shakespeare” on page 30 of Pope’s 1725 edition. Ignoring the tiresome refrain that Vertue’s Bust image is a copy of the Chandos, note that in 1885, critic Norris recognized not only that this not the same face that was reproduced in Rowe’s 1709 edition, but that the face on Vertue’s Bust is nothing like the face he created for Pope’s frontispiece, thus the two images of Shakespeare in Pope’s 1725 edition portray two entirely different persons! 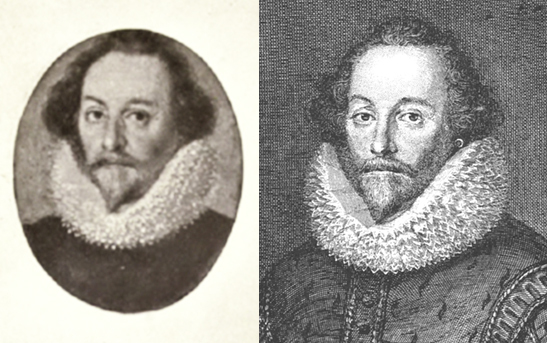 Vertue’s two images of Shakespeare with a collar compared with the Chandos. That many, perhaps most, who glance at a portrait may see in it what they wish to see, not what is actually there, we can accept, however grudgingly, but that critic after critic, scholar after scholar, down through the centuries, has continued to repeat, over and over, that Vertue was replicating the Chandos in his engraving of the monument has been a rather devastating revelation of the stupendous ignorance of writers and scholars when it comes to visual matters, for there could hardly be any two portraits that look less alike than the Chandos and Vertue’s version of the face on the Bust. What should be immediately obvious to anyone who has compared the two is that when asked by Pope to provide an engraving of the Stratford monument, for some reason Vertue replaced the face on the Bust, whatever it was, with the face of his Shakespeare with a collar––not! again! NOT a version of the Chandos! In fact it seems that never in any of its various incarnations has there been an attempt to recreate on the Bust the face of the Chandos. 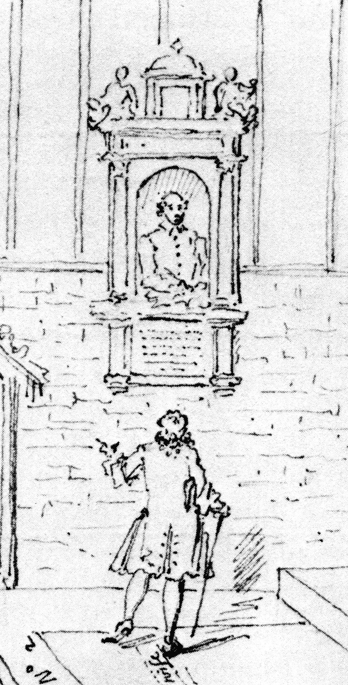 Most curious of all is the fact that Vertue, whose 1737 sketch of his patron looking up at the Stratford monument during their Stratford visit appears to have the same head as in the Dugdale 1634 sketch, minus the moustache and with pen and pillow replacing the woolsack. Admittedly these are rough sketches, but even so, the head and face of the Vertue squiggle looks most like the Dugdale versions of the Bust, nothing like any of its later incarnations. Original Dugdale image: Left: his 1634 sketch; Center: the Wenceslas Hollar version for Dugdale’s 1656 book; Right: Vertue’s 1737 sketch. This suggests that when Vertue and Harley saw the Bust in 1737 it had not been altered since 1656 when Dugdale published an engraved version of his earlier sketch in his Antiquities of Warwickshire. Was Vertue’s 1737 sketch, with the addition of the pen and pillow, the first suggestion of how he (and Edward Harley) thought the Bust should look, rather than how it actually looked at that time? Was his version of the Bust as portrayed on page 30 of Pope’s 1725 edition, not an illustration of what the Bust actually looked like then, but a projection of what he was suggesting it be made to look like? And why did Alexander Pope allow it, possibly even promote it, as the image to face his chapter on Shakespeare’s Life? During the early 1720s when Alexander Pope was at work on his edition of Shakespeare, the issue of the Bard’s face and the problems it presented must have roused Pope’s curiosity. How interesting that the choices he made for his Shakespeare edition, condemned by critic Norris a century later, show that he avoided what would have been his most likely options––for the frontispiece, the Chandos or the Droeshout; for the “Life” the Dugdale engraving, choosing instead Vertue’s 1721 Shakespeare with a ruff, taken from the miniature owned by his patron, Edward Harley, and, on page 30, for the “Life” by Rowe, Vertue’s 1719 Shakespeare with a collar. Pope’s edition stimulated a renewed interest in Shakespeare, which perhaps included, among his Scriblerus coterie at least, a curiosity about his image. It may be that Harley and Vertue’s 1737 trip to Stratford to view the monument was in response to this curiosity. The lifesized statue of the Bard is the centerpiece of a huge marble screen that creates a separate space from what had been until 1741 an open area where the floor was lined with plaques honoring various poets (and others) buried beneath it. With the addition of the great screen that not only holds the Shakespeare monument, but provides a wall where other memorials soon found a niche in the increasingly crowded Poet’s Corner, these floor plaques were lost, among them the ones marking where in 1599, Edmund Spenser, and in 1616, Francis Beaumont had been buried. The creation of this monument came at the peak of the Augustan era, often marked as having ended with Pope’s death in 1744. Noting that Vertue was a trustee on the committee that planned this memorial, and that he had submitted a design for it (now lost) that was passed over in favor of the Kent design, Hannas points to several facts about the memorial that in his opinion suggest that the project had actually originated with the Harleys. With Edward Harley’s death in 1741, Vertue continued to serve his widow, Henrietta Bentinck Holles Harley, Countess of Oxford, who looked to him to examine and inventory their collections, much of it at Welbeck Abbey, which she had inherited from her Cavendish father. Following her husband’s death she commissioned Vertue to make a number of engravings from the portraits in his collection. In 1742 she sold his collection of portraits, prints, Greek and Roman antiquities, coins and medals at auction, reserving for herself and her family portraits of family members, including the Welbeck portrait of de Vere which passed with her death in 1755 to her daughter, Margaret, Duchess of Portland where it remains as part of the Portland collection on loan to the National Portrait Gallery. There can be no doubt that Vertue, who had helped this Countess of Oxford prepare the catalog for this sale, knew this portrait and so, as a portrait artist, was aware of the qualities of his face, the high forehead and pursed lips. 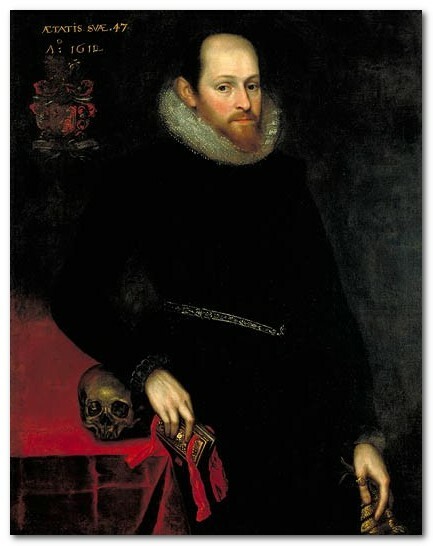 In his notebook, Vertue mentions that he knew of another portrait of de Vere by Cornelius Ketel, active in England in the 1580s (now identified by some as the Ashbourne). Vertue claimed (sometime after 1712) that Henrietta Stanley, Countess of Strafford, daughter of the 7th Earl of Derby, the son of Elizabeth Vere, de Vere’s eldest daughter, had owned a portrait of de Vere by Cornelius Ketel (Ruth Miller 2.418). She died without issue in 1685, leaving it to her husband William Wentworth, who left a large collection at Wentworth Woodhouse, which then passed to his descendants. 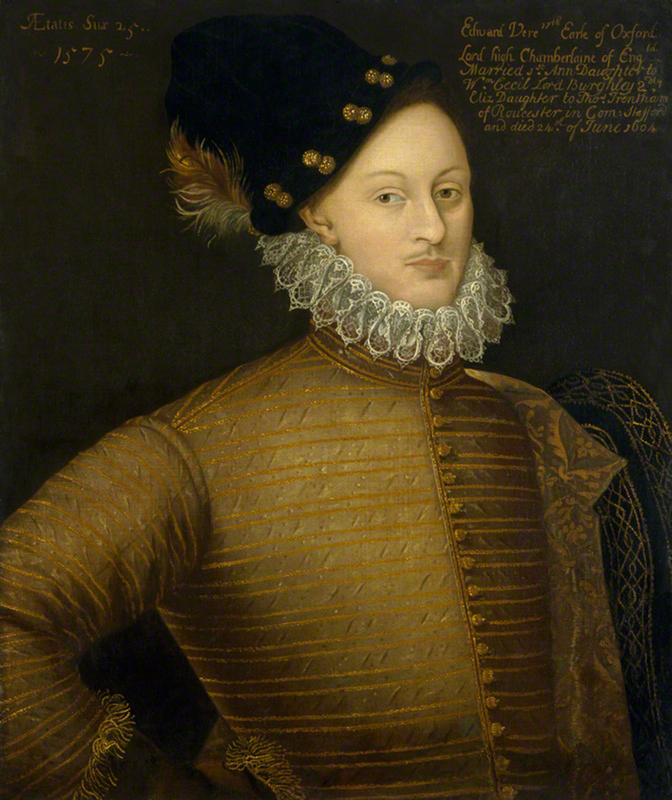 Some years ago, authorship scholar Derran Charlton, in researching the Earls of Strafford archives at Wentworth Woodhouse, found an old inventory that included a three-quarter portrait of the Earl of Oxford. There are other extant portraits of de Vere: the Ashbourne and the Welbeck. 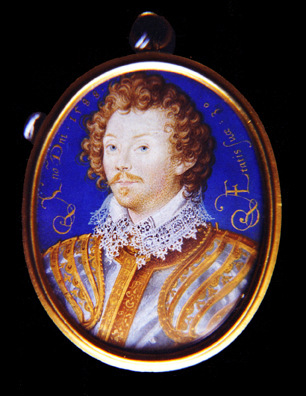 There is also a Hilliard miniature of Oxford in his thirties with blond curly hair that belongs to the Duke of Buccleuch. Although Hilliard is not a particularly trustworthy reporter of a likeness (he tended to give everyone a pie face, little nose and weak chin), we do see the pursed lips that suggest de Vere. It’s certainly not unreasonable that there are, or have been, other portraits of de Vere than these that have been identified. 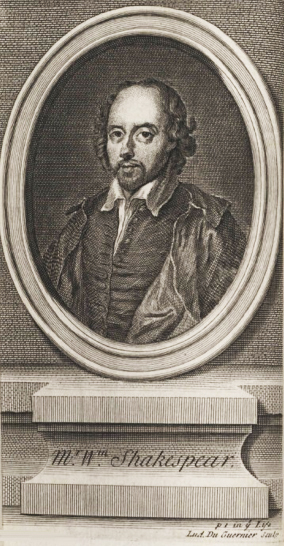 I propose that Vertue based his engraving of Shakespeare with a collar on a portrait of de Vere, painted in his fifties, that Vertue had access to at that time through Henrietta Holles, Countess of Oxford (by the second creation), that is now lost or at least is not presently accessible, and that he, and his patron, Edward Harley, 2nd Earl of Oxford (by the second creation) knew (or believed) that its subject was the true author of the Shakespeare canon. I’m forced to consider this because the face in this engraving––and in the Bust engraving based on it––a face that looks nothing like any other portrait of Shakespeare, that are so similar to those in the Welbeck and the Ashbourne, each from different stages in his life. I believe this, one: because the face reflects intelligence of the sort not found in any other image of Shakespeare; two: because it simply isn’t possible that Vertue could have come up with such a real face out of his imagination; and three: because there are mentions throughout the literature of other portraits of Oxford that haven’t yet been located or identified. I propose that this lost portrait was painted when Oxford was in his fifties. As for the hairline and the collar, the bald head on the Vertue portrait may reflect his own hairline as it was in his fifties, or both may be Vertue’s attempt to corelate the image in the original portrait with the standard image of Shakespeare. The Welbeck, the Ashbourne, and the Vertue. Putting them together, we have the Welbeck from his twenties, the Ashbourne from his forties, and the Vertue from his fifties––all reflecting the same facial structure, the same nose, and most uniquely, the pursed lips. That the Harleys were curious about Shakespeare is obvious. That they were also curious about the Earl of Oxford seems to be equally apparent. The very fact that Robert Harley, poet, patron of poets, chose to call himself Earl of Oxford rather than some other antiquated title, suggests that his choice of title was based on something more than just a remote family connection. I propose that the Harleys knew that Oxford was Shakespeare, and were invested in recovering the truth. A diligent collector, it’s no accident that his son married the heiress, a descendant of Oxford’s cousin, Sir Horatio Vere, who would bring him de Vere family heirlooms, papers and books. Their daughter Margaret brought the vast inheritance of their combined estates to her husband, the Earl of Portland. Having grown up in the company of poets like Swift, Pope and Matthew Prior, surrounded by the libraries, aviaries, botanical gardens and collections of three great houses, Margaret continued the family tradition of collecting and preserving the antiquities of her aristocratic culture. Among the possessions she brought her wealthy husband was Welbeck Abbey, former home of a branch of the Cavendish family, where the one certain portrait of the 17th Earl was located. It was a Cavendish who had, years earlier, had purchased Fisher’s Folly from the 5th Earl of Rutland (or from whoever had purchased it from Rutland), his descendants turning it into the fabulous Devonshire House. This is but a passing glance at the mare’s nest that is the story of the Shakespeare image, its purpose not to prove, only to suggest, that Vertue’s trained and practised eye found his true image in a no longer available portrait of Edward de Vere, that he and Alexander Pope, promoted it as best they could in the face of an increasingly monolithic dedication to the Stratford biography. Someday, hopefully, an energetic Art historian will take on the task of tracking the provenance of these images, providing the scientific measurements of a moon for which this article can only be the pointing finger. I really enjoyed your post on Vertue, and I think your conclusions are correct about his part in a plan to transform the image of Shakespeare away from the Chandos. But I was hoping to see a discussion of the Folger’s Profile of Shakespeare by Vertue that would seem to be based on, well, I’d guess the Chandos (but you might disagree). Certainly Vertue’s drawing is consistent with many of the early copies of the Chandos. Anyway I’m including the link to that portrait because you might be interested in it. It’s another piece to the puzzle. Again, thank for a great post. Lee, thanks for the information! This drawing is new to me! I need to know more about it! They are wrong about the Chandos. It’s an important piece of the puzzle, but to claim that the Vertue images are versions of the Chandos is more absurdity from people who see only what they want to see. This one too is certainly not derived from the Chandos. Who is it? Who created it? What is its provenance? Interested parties want to know! I don’t know how much of this is to be trusted, given genealogical errors such as these: Henrietta Cavendish (NOT Bentinck) Holles Harley, Countess of Oxford, was a granddaughter, not a daughter, of Gilbert Holles, (3rd) Earl of Clare. Her father was John Holles, (4th) Earl of Clare and Duke of Newcastle. It was her daughter Margaret who later became a Bentinck through her marriage to the 2nd Duke of Portland. I don’t know enough about the other persons mentioned to know whether or not their families are similarly scrambled, but these errors were enough to cause me to stop reading. Perhaps that’s my loss, but at least I’m no longer annoyed. Thanks for the feedback. I will give a closer look at the points you raise and amend where needed. I greatly appreciate the help I get from readers who know more than I do about those areas that fall outside the main stream of my inquiry, which is certainly the case with the group that included the earls of Oxford of the second creation. For me, the backgrounds of Vertue’s patrons are only details, but of course they should be as correct as possible.